"Why did the chicken cross the road?" is always good for some giggles on the schoolyard. But it's no laughing matter when a deer, coyote or goose crosses a runway or flightpath to get to the other side. In the most serious cases, it can be a matter of life or death. Amid billions of dollars in passenger-oriented enhancements occurring inside Los Angeles International Airport (LAX), substantial improvements are also occurring for airlines out on the ramp-especially in Terminal 7, which is used exclusively by United Airlines. The firm that operates Terminal 4 at John F. Kennedy International Airport (JFK) faced a unique challenge last year: It would soon have four carriers flying Airbus 380s into the terminal, and only two gates were equipped to handle the double-decker aircraft. 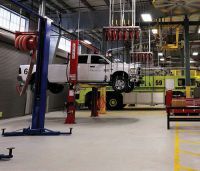 Getting a new facility approved, funded and built is typically a daunting task. But every now and then, things just seem to fall into place. 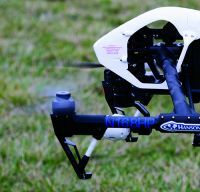 That was the case for Mark Day, director of engineering and maintenance at Blue Grass Airport (LEX). Ever since the heyday of Mississippi steamboats, the Quad Cities that straddle the mighty river have been a hub of agricultural, industrial and commercial activity. With Bettendorf and Davenport on the Iowa side of the river, and Moline and Rock Island on the Illinois side, transporting goods and people is a historic and current key to the area's prosperity. A system recently deployed at Cancun International (CUN) is centralizing the operation and management of passenger information displays at nine southeast Mexican airports. Currently in full operation, the system is simultaneously delivering multiple benefits to the traveling public and the airports' operator. Getting passengers in and out is a continual challenge at older East Coast airports, where congestion is often a standard element of the local landscape. 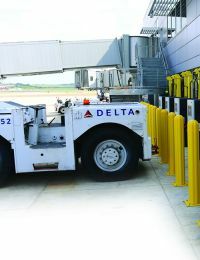 Hardstands allow them to accommodate more aircraft and passengers than contact gates alone; but they also create the need to shuttle customers between the tarmac and terminal. With substantial overnight air traffic from DHL Express, it's imperative for Cincinnati/Northern Kentucky International Airport (CVG) to keep its runways open 24/7. When temperatures drop and precipitation flies, all eyes are on the snow removal crew to keep DHL's airplanes flying. Managing the residual chemicals from deicing operations at Portland International Airport (PDX) includes vexing challenges on two fronts: Portland's highly variable winter weather is unpredictable at best, and its local environmental regulations are predictably tough. Green has long been the color of choice at Seattle-Tacoma International Airport (SEA); and this season, it's more popular than ever. With a $43 million pre-conditioned air project largely complete, SEA looks forward to reducing costs to its resident airlines by $15 million per year and producing equally substantial reductions in emissions. Snow removal is a big issue for all Wisconsin airports, but inadequate storage for snow removal equipment was making it more problematic than necessary at Austin Straubel International Airport in Green Bay. From hot and humid to dry and dusty, airports in Florida and Nevada are providing a spectrum of high-mercury environments to test a new generation of preconditioned air units. Daytona Beach International Airport had a choice to make. Its five passenger boarding bridges that were put into service in 1992 were due for inspection. The ball screws supporting the vertical drive on the FMC Jetways would have to be pulled and inspected. If they were cracked, they would have to be replaced. There was also pervasive corrosion and the cabling was deteriorating. Teamwork between the airport and airlines has enabled Philadelphia International Airport (PHL) to secure the most Voluntary Airport Low Emissions (VALE) funding of all airports nationwide during 2008 - about $4 million, in total. American Eagle Airlines is tightening control of its ground support equipment at Dallas/Fort Worth International Airport (DFW) with the use of radio frequency identification (RFID) and other wireless technologies - a first at any U.S. airport, according to the system's manufacturer. Officials at Dallas/Forth Worth International Airport (DFW) have taken a proactive approach to combating delays for aircraft waiting to dock in inclement weather or when ramp staff is unavailable. 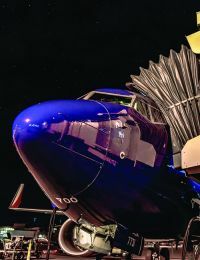 In doing so, they are also reducing aircraft emissions, providing better customer service and saving the airport's largest carrier an estimated $14.5 million per year.